But the spirit of Stealth Force Beta Operatives cannot be quelled when a mission is at stake (especially when the alternative is to fester overnight in a cramped greasy pit). Climber and Ratchet activated their flashlights and surveyed the situation. The mission's only hope lay in the 6-inch gap between the elevator car and the cinder block wall of the elevator shaft. Operative Ratchet's construction was too substantial to pass through the crevice, but Climber's thin physique enabled him to just barely fit into the space. Recall that unfinished cinder block is considerably rougher than most brick walls, and that hard scratchy mortar oozes between the blocks forming additional abrasive impediment. Climber was daunted, but had no alternative to squeezing through twelve feet of confinement. In his ascent, Climber ripped many holes in his jeans, some in his shirt, and a few in his skin. He ended up thoroughly coated in black grease with highlights of crimson blood. While compressed between the elevator car and the bare cinder block wall of the elevator shaft, it was apparent that should the elevator car move, Climber's fate would resemble a wad of chewing gum scraped along a sidewalk. To prevent such movement, Ratchet kept his hand on the emergency stop button. Finally, after 15 minutes of grueling effort, Climber finished his gruesome hardscrabble ascent to the upper surface of the elevator car. After calling down to Ratchet, he activated the handy light and used the controls to raise the elevator to the first floor. With the elevator car no longer blocking the exit, Ratchet tripped the door catch and escaped from the greasepit into the civilized empty hallway of the basement. Then he joined Climber atop the elevator, and the original plan was restored. A few hours later, it was midnight and time for the rest of us to get involved. I had the first lookout shift, so while the others snuck into the building, I lurked in the parking lot in my pickup truck, equipped with a headset radio to signal those inside when a police patrol came by. Things were quiet on the Beta radio channel that night; everyone seemed quite busy, and I turned on my truck radio to pass my time of idle vigilance. Operatives Sushi, Climber, and Ratchet filling the elevator car. Note the cleanliness of the vicinity. After ascending the stairs two at a time, I arrived at the heart of the operation at the second-floor entrance to the elevator shaft. The elevator remained on the first floor where Climber had brought it, and its power had been cut at the top control so there would be no surprises. Climber, a melange of shredded jeans, grease, and clotted wounds, looked like he had been run over by a bus. "Great Scott! Did you fall down the shaft?" 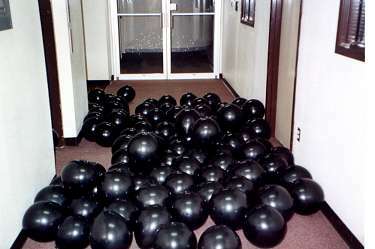 Climber grunted, handed me a fistful of black balloons, and staggered into the hallway. He leaned against the wall, short of breath, and told me how I had brought the ceiling down upon them. While I listened, I filled balloons. First, we put a handful of pebbles into each balloon to provide weight so the balloons would flow outward when the elevator doors opened. We didn't want them to sit there like a bunch of balloons. Then we applied several lungfulls of air, tied the stem, and dropped the completed unit into the open roof hatch. My first five or six balloons went without difficulty, but I soon discovered why everyone was so short of breath. Filling dozens of balloons is enough to make one woozy. This was an operational bottleneck we had not planned for. The limiting factor in our progress was maintaining consciousness. The hours passed wearily. We were unable to fill all our balloons by 5am, our failsafe quitting time before the sun rose. We had the elevator about three-quarters full of 250 balloons, and packed up. At 5:30, we declared the mission complete, closed the hatch, and re-activated the elevator power. A terrible thing happened. When Climber had lifted the elevator out of the basement, he had used the controls on top of the car, not the civilian push-buttons inside the elevator. Climber hadn't brought the elevator precisely to the ground level--it was a few inches off. Recognizing this misalignment, the elevator initialized itself when turned on. It shuddered, gathered its bearings by moving down a few inches to align itself with the ground level, and to demonstrate that it was now ready for business, it opened its doors. Our balloons spilled all over the ground floor hallway. "We've got almost an hour before the building's unlocked! Grab balloons and move!" 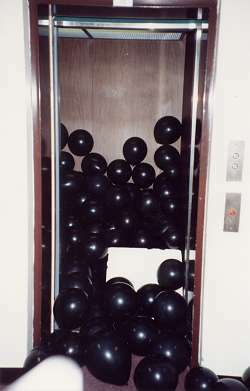 We stuffed as many balloons back into the elevator car as we could, and the doors obligingly closed. At least 75 balloons remained in the hallway, and the trouble with inflated 11-inch balloons is that it's not possible to carry more than about four or five at a time. 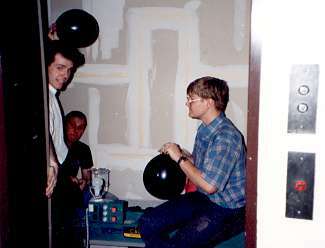 We decided to send the elevator to the basement so we could pour the balloons back in through the hatch. But as we started the disaster recovery, we heard the front door open, and someone entered the building. Two of us stealthily descended the stairs and saw a light on in the Business Administration office, almost directly across the hallway from the elevator. We were caught. Hoping that a completed mission with one civilian in on our secret was better than an incomplete mission with our secret intact, I opened the door to the Business department, walked in, and introduced myself. "Hi. Did you happen to notice the balloons in the hallway?" The professor, who sat behind a desk with a nameplate reading "Peter Anselmo," smiled and said "Yes--I did." "Well, we're filling the elevator with those balloons before the building opens up for the day. We've been at it all night, had a bit of a mishap, and hope you won't mind if we continue for a little longer to tidy things up." He agreed to be inattentive to our activity, said he had about 15 minutes' worth of business to conduct, and even said he'd lock up the building when he finished. Once we were done, we taped our carefully crafted "OUT OF ORDER" signs to the three sets of elevator doors; we also applied black electrical tape to the elevator call buttons to discourage anyone from using the appliance before we returned. We were all exhausted, and returned to our domiciles to sleep a few hours before activating the trap we had set. At 9:30, we re-convened in Brown Hall, removed the tape and sign from the ground-level elevator doorway, and lurked in the Admissions office awaiting an unsuspecting victim. We didn't have to wait very long. Our victim was a portly secretary wishing to avoid the twelve-stair ascent from ground level to the second floor. She pushed the call button, and the elevator came; as the bell rang signifying its arrival, we giddily awaited the flood of balloons. The doors opened. The ceiling tile that kept the balloons penned inside the elevator. But only a dozen bounced into the hallway. The secretary had a dumbfounded look on her face and headed for the stairs. We were even more dumbfounded and investigated. A 2-foot-square ceiling tile served as a dam preventing most of the flood. The elevator's ceiling had no tiles. We had not put any tiles into the elevator. Ergo, someone else had put it there! We never figured out exactly what happened. Our reigning theory is that someone in the building was doubtful of our "OUT OF ORDER" signs--perhaps they were with Physical Plant and knew no elevator work was scheduled. Or maybe they suspected Physical Plant wouldn't have bothered to put up signs at all. At any rate, someone called the elevator and activated the trap. After being surrounded by balloons, he recognized that resetting the trap was an involved process. Using a ceiling tile to support the balloons, he re-filled the elevator by tossing the balloons one at a time over the tile. Finally, he let the doors close while leaving the ceiling tile in place. When the secretary arrived, the ceiling tile prevented full deployment of the elevator contents. A free printed copy of these Beta chronicles will be given to the first person who comes forward with what really happened. While Operation Up Your Shaft was the least successful Stealth Force Beta mission, it demonstrated the profound fortitude of Beta operatives. In commemoration of the effort and sacrifice endured by Climber and Ratchet, they were both given Beta Medals. The existing medal for Bloodloss in the Line of Duty, The Purple Toe, was applicable but did not reflect the extreme nature of their challenge. We created a new medal--The Greasy Rail, awarded for Miserable Suffering and Valiant Escape from a Wretched Greasepit. Ratchet became the only Beta member in history to receive both Beta Medals--his Greasy Rail complemented his Purple Toe awarded for his facial entanglement with a grappling hook in Operation Public Hanging.